Houghton Bowls Club came into being in the summer of 1987, when a small group of villagers obtained permission from the village hall trustees to take over a former tennis court and convert it into a bowls rink. Play began the following year and the rink was formally opened for the club's first full season on 22nd April 1989. All the work was done by local volunteers who created an excellent playing surface with space for four full length rinks. You can read the full story in the pdf document below. The same philosophy holds good to this day when most of the routine work is done by club members. A professional green keeper is contracted to advise and perform heavy jobs that need specialist equipment. This all serves to keep subscriptions low and foster club spirit. The club does not compete in leagues, but we have a full programme of friendly matches throughout the summer season against other local clubs. We also run internal competitions for singles and mixed doubles. 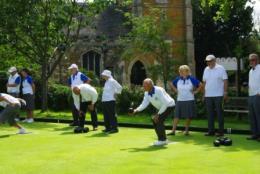 The Bowls Club, which came into being in the summer of 1987, is based in the heart of the village of Houghton on the Hill on Main Street where there is a flat four-lane green beside the Village Hall and plays short mat indoors during the winter. Call Dave (Chairman) on 0116 243 2630 or Rosie (Secretary) on 0116 241 4896 or email houghton.bowls@hotmail.co.uk for more information. We use the village hall in lieu of a club house and many members also continue their conversations in the nearby Black Horse Inn. 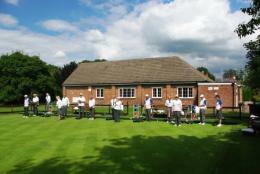 The club currently has just over 30 members and is actively looking to increase its membership. Tuition and loan equipment is available for beginners. In July each year we enjoy our annual weekend together in Norfolk where we play matches against Cromer and Wells-next-the-sea (See picture to the left). 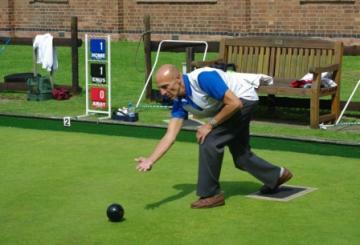 'More adventurous' members have enjoyed bowling holidays together in Tenerife and Torremolinos.